This picture came out of a presentation I was asked to give, but that was then cancelled. There I was with a half-finished talk in my brain and some sketches plotting out my opening statement with those big letters representing Teaching and Learning (and Testing). As I didn’t want the idea to be one of those abandoned scribbles in one of my notebooks, I decided to make a print out of it instead. The idea started out with the concept that Learning Happens in the Tangents that I picked up at a recent conference (thanks again to Jesse Stommel), which is such an important truth – so often not appreciated by students, and maybe us lecturers as well. I like the idea that Teaching goes beyond what is contained in the ‘lesson’, it almost ripples out; while Learning takes place again not just in the lesson, and not just inspired by it, but rather gets often sparked by those ripples and connections the individual makes. I am constantly fascinated by what students pick up from a lesson – and what they don’t. That is the great thing about developing independent learners (and thinkers), rather than getting them to memorise a lot of stuff. However, there is a flipside to that – certainly in the culture that I work in. This is, of course, Testing. Testing is very often incredibly narrow, and it doesn’t usually test the learning that took place, but only the learning that intersects with the teaching (and often only a very narrow concept of the teaching). I wish the system wouldn’t be that concerned with testing, as that might open up the students to explore more of the ripples and not care so much about the testing. … and for whoever is interested: the print is two colour screenprint, one colour risograph and some hand-colouring. 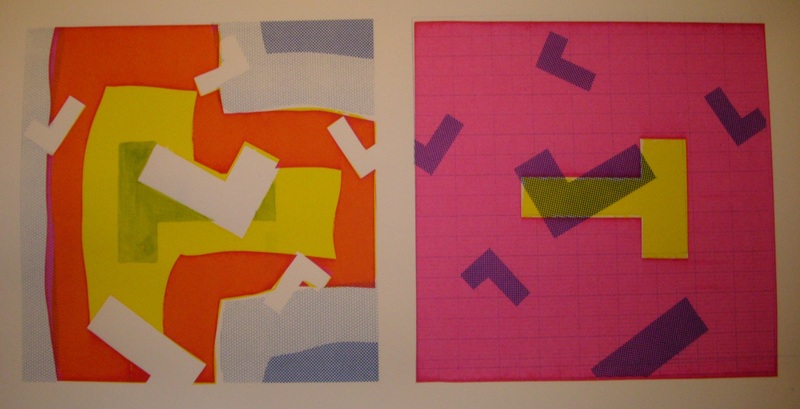 One of the things on my itinerary last spring (as a regular reader of this blog you might remember that I was on a sort of sabbatical) was a spring concentration at the Penland School of Crafts. For people interested in crafts this is a very special thing to do – you spend two months on campus in the Blue Ridge Mountains of North Carolina with 24 hour workshop access and literally no outside distractions, giving you the opportunity to immerse yourself into your creative practice and just make. I had been there before, two years ago, when I took a two week class in the letterpress studio, and that had been pretty cool. To be able to come back for two months was an amazing opportunity and experience – and while it wasn’t cheap (as a non-American I didn’t qualify for the work study programme), it was an investment in myself that I am happy I made. The concentration I took was called ‘Personal Cartography’, which is what attracted me. I love maps and the idea of devoting two months of my life to just concentrate on making maps and thinking about ways of documenting my environment was too good to miss. Like probably a lot of people who teach within the creative arts, I struggle with finding the right balance between the teaching (and all that comes with it) and the time to develop my own creative practice. 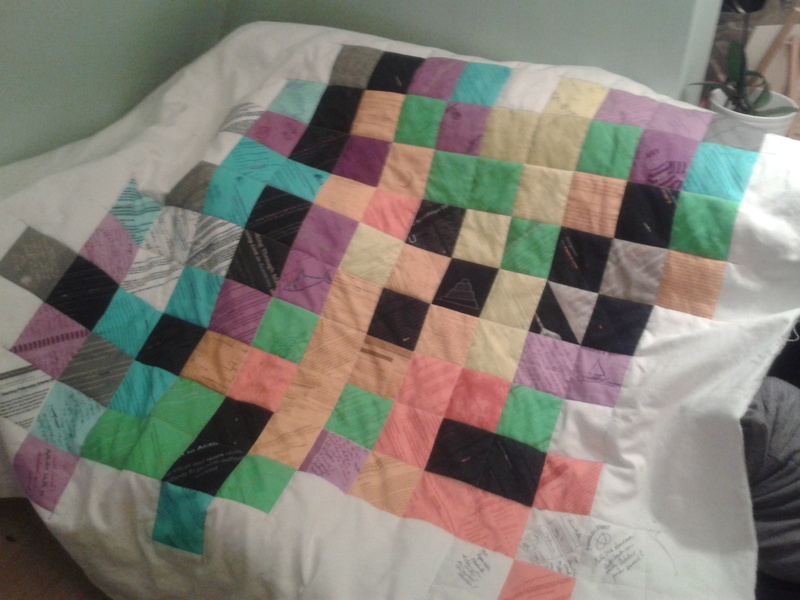 This class seemed like the logical extension to the work on the patchwork quilt I had been doing, which is based on mapping my learning and teaching experiences.The concentration sounded like it was custom-made for me and it came at exactly the right time (me thinking about taking a short break from teaching), so I signed up. What was secondary for me was that this was a weaving class. Robin Johnston, our teacher, uses weaving to translate different ways she charts her own life (find out more about her work here). Most of these probably wouldn’t be considered as traditional maps, but I love the concepts and thoughtfulness of the work. And I didn’t mind to dip my toes into weaving. I didn’t really have any experience in it, we must have done very simple weavings in primary school, but I knew nothing about weaving on a big loom. However, I like learning new stuff and I figured if the weaving wasn’t to my taste I could always just find other outlets for my mapping. Suffice it to say, I had a great two months. Sometimes it was really challenging, but at the end of the day I came home with a body of work that I am really proud of, a sort of meditation on identity. What I didn’t expect was that this experience also made me think – and understand better – the differences between studio-based practice and academic practice, between practice and theory, between demonstrating and teaching. Ever since I started teaching I was aware that there is a difference between working in the studio and working in the lecture theatre and seminar room. Getting these two better aligned is in a way what Tactile Academia is all about. But I’m not sure I fully understood it. Don’t get me wrong, I can talk about it in detail with all the nice little references to theoretical models that the academic community likes so much (and have done exactly that at a number of conferences and in some papers). But the actual experience of it, of intensively learning a practical skill from scratch, something I clearly must have had in the past, must have faded somehow. Let’s say that having the refresher was eye-opening! My first threading of a loom in progress. There are things that are incredibly hard to learn out of a book, but quite easy to pick up if somebody actually shows you. Case in point: For this course Robin had recommended Deborah Chandler’s book Learning to Weave, which as a complete swat serious student, I of course bought and started to read before flying over to the States. This is an excellent introductory book with lots of pictures in it – which I now know with hindsight. Initially most of the information in it was baffling to somebody who didn’t have access to a loom. Turns out that threading a loom is a mind-blowing concept for somebody with no real reference material. Getting an actual demonstration on how to thread a loom, on the other hand, makes this manageable. Putting it into practice yourself makes it easy (yes, you have to pay attention that threads aren’t crossed, and count heddles, but if you put the practice in, it gets easier – and faster – pretty quickly). So weaving, as a practical skill, I learned through demonstrations and practice. And a funny thing happens: once you have acquired the basics, the books make sense. After a few weeks of practice (practice as both a verb and a noun), I was able to understand the Chandler book that had confused me so terribly at the beginning. I also was able to learn how to do double-weave from a book with only a few questions for Robin. Picking up the ‘personal cartography’ bit of the course was much harder. It’s a much more abstract concept. I think the difference was that while the weaving was demonstrated, the personal cartography was taught. For this we had readings on different practitioners, reference materials, sketchbook exercises, but overall this was much more loose, requiring analysis and independent study. Now you might remember me saying that this, and not the weaving, was my main reason for being there. It was scary how easy it was for me to get distracted by the call of the loom. This magical process that I could literally see I was getting better at with every inch I finished. Of course throwing a shuttle back and forth can become a meditative process pretty quickly, too, and that might have been part of the appeal. But overall, I think I realised that there is something basically almost immediately satisfying about skills that are taught by being demonstrated. Is this one of the differences between studio practice and academic practice? Essay writing, a part of academic practice, can’t really be demonstrated in the way initial stages of studio practice can. I cannot immediately show the students what is going on in my head when I research and write. I can try to tell them – and I do. I can try to break this down into steps and give them these steps as tasks – which I do. I can show them different stages of drafts – which I do, but we rarely have time to explore these in detail. But this is more teaching by prompt rather than teaching by demonstration. Once they acquire the basics, it becomes a matter of practice. Then advice will make much more sense, just like the weaving book suddenly made sense to me. But getting there by prompt is harder than getting there by demonstration, I believe. And this might be doubly hard if they at the same time are learning skills by demonstration – the skills based in the studio, what they “came to university for” (a distinction I often hear from students trying to defend why they didn’t do the writing tasks I set them), the skills that are much more immediate and – dare I say it – fun. 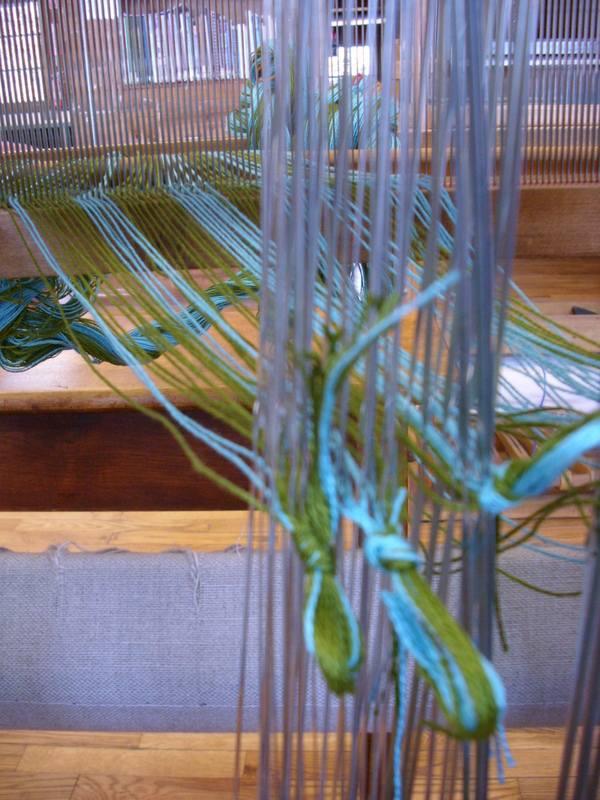 I think that after my learning to weave experience I now understand the ‘call from the studio’ better. In a way it affirms my thinking that breaking down the first stages of academic practice into aspects that can be visualised or experienced somehow is a good way. Maybe this understanding can help with utilising demonstrating techniques in the seminar room.